Question: Do you know the purpose & use case of vRA? Have you ever troubleshooted VM provision failure issues in vRA? Let’s assume there are two flavors of Desktop Win 7 & Win 10 with couple of software’s like Chrome, Mozilla, IE & Java. Can you help me to explain the troubleshooting steps which you follow for the VM provision failure problem with given software’s? Answer: As the focus shifted from VMware operations to automation, most of the Interviewers asking questions related to vRealize Automation with the primary use case of automated provision failures when requested from the user portal. 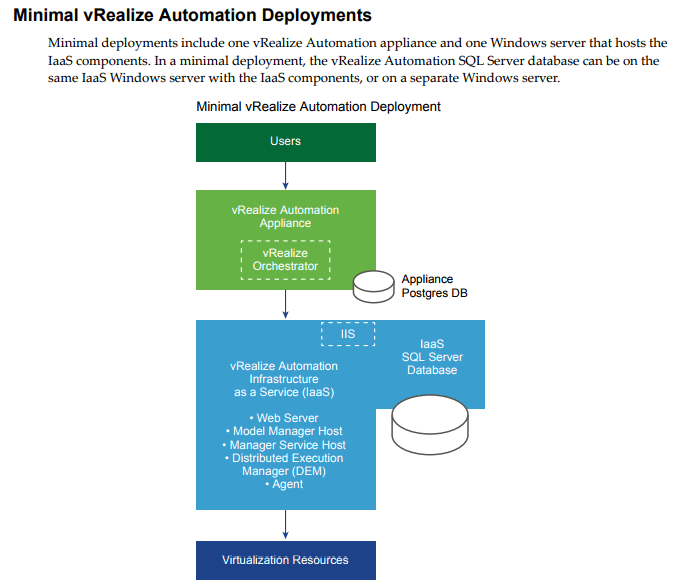 Let’s recap how to define this vRealize in VMware words – vRealize Automation enables IT Automation through the creation and management of personalized infrastructure, application and custom IT services (XaaS). This IT Automation lets you deploy IT services rapidly across a multi-vendor, multi-cloud infrastructure. Let’s start the explanation with the scenario like – You got the call from DevOps team as they failed to provision the VM’s from the self service portal. Assumption for this case is – vRA deployed in minimal setup with 3 servers, Tenants, Blueprints, catalogs and necessary configurations are pre-configured. You use blueprints to define machine deployment seĴingsǯ Published blueprints become catalog items, and are the means by which entitled users provision machine deployments. vRealize Automation provides a secure portal where authorized administrators, developers, or business users can request new IT services and manage specific cloud and IT resources, while ensuring compliance with business policies. Requests for IT services, including infrastructure, applications, desktops, and many others, are processed through a common service catalog to provide a consistent user experience. You need to start with GuestAgent.log file to see if there any connection failures. We speak a lot about the overall process but please note vRA product has many areas to look at before you conclude the problem area. So let me conclude the answer for the interview as – first error message occurred as the new ESXi host joined recently missing particular VLAN 150, which is required for VM to communicate with IaaS server. To fix the issue we need to work with Network team to trunk/enable VLAN 150 for this ESXi server Physical NIC’s. Second error message which I mentioned earlier caused by darwin account has an expired password as the Company password policy requires all the user account passwords require to change the password in 90 days or get an exception fpr special services accounts. 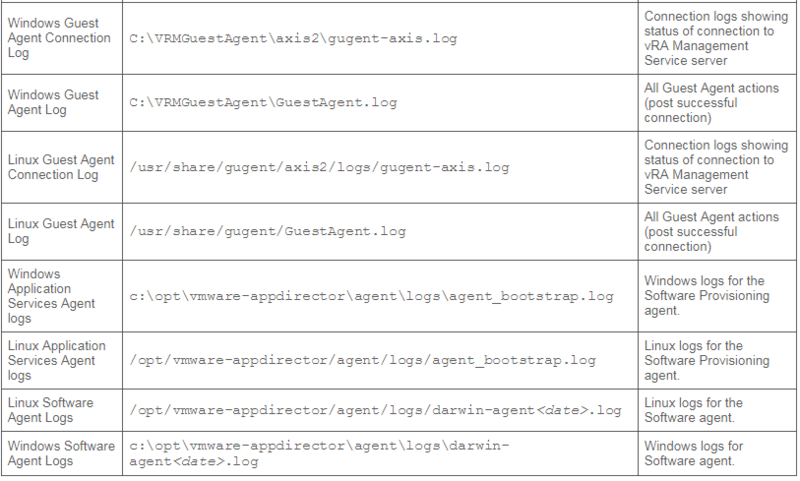 In this case darwin is not treated as service account as this one is local to the specific VM provisioned. If you can explain 50% of the content which I explained in this blog post, your Interviewer can be convinced that you have some knowledge in vRA product. If you want to talk more about key features of this product, here is the required information. • Unified IT service catalog – deliver infrastructure, container, application and custom services (XaaS). • Policy-based governance ensures the right service level to meet specific business needs. • Automation accelerates IT service delivery. • Streamline IT service design process by assembling applications from prebuilt components using a visual canvas with a drag and drop interface. • Blueprints as Code – Export, import and edit automation blueprints as text. • API – enable the entire design and management process via API calls. • Leverage VMware and partner-provided blueprints in VMware Cloud Management Marketplace. • Flexibility to choose the right cloud platform and location that meets the business needs. • Consistent governance and control across hybrid cloud deployments. • Extensible platform that enables customization and extensibility at multiple levels across IT ecosystem. • Design and automate the delivery of any IT services (XaaS) through service orchestration. • Leverage VMware and partner-provided integration solutions in VMware Cloud Management Marketplace.